internships, youth programmes, consultancy and research. "Unless Environmental considerations are built into development plans, the latter's long term viability is at stake. This can only be achieved through widespread awareness and understanding of environmental issues and the interdependence of man with his environment. Against this background, the creation of an institution specifically devoted to environment education would be a far-sighted and significant action. The setting up of such a Centre, while giving a unique opportunity to mobilize and direct the national environmental education effort also places a tremendous responsibility on it. Its tasks become all the more challenging given the enormity of the problem and the economic constraints of the country". Sustainable Development and Education for Sustainable Development was, thus, very much a part of CEE's objective. The United Nations has declared 2005-2014 as the Decade of Education for Sustainable Development (DESD), which aims to promote education as the basis for a sustainable human society, and to strengthen international cooperation towards the development of innovative policies, programmes and practices of Education for Sustainable Development. With twenty years of experience in EE and ESD, CEE finds itself well prepared to lead the country in this Decade. It conducted the first international conference of the Decade, ‘ Education for a Sustainable Future ', from 18 to 20 January 2005 at Ahmedabad. Government of India, UNESCO, UNEP and several other partners, supported this event, which brought together more than 900 participants from over 50 countries to discuss what the Decade could do to re-orient the vision of development, and how educators can facilitate this process. The participants also laid out roadmaps for ESD action in 20 sectors, through concurrent workshops. 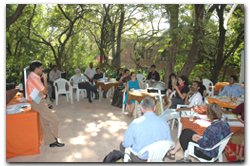 ESF had been preceded by ‘ Samvaad – A Dialogue for Sustainable Rural Development ' organised by CEE and its sister organisations VIKSAT, CHETNA, VASCSC in December 2004 at Gandhinagar. This event facilitated dialogue and lateral learning for sustainable rural development among 1200 people from about 200 villages in Gujarat.